This shortcode renders information about the referring affiliate, if applicable. Pages using this shortcode should not be cached. Supported values for the display attribute are as follows. 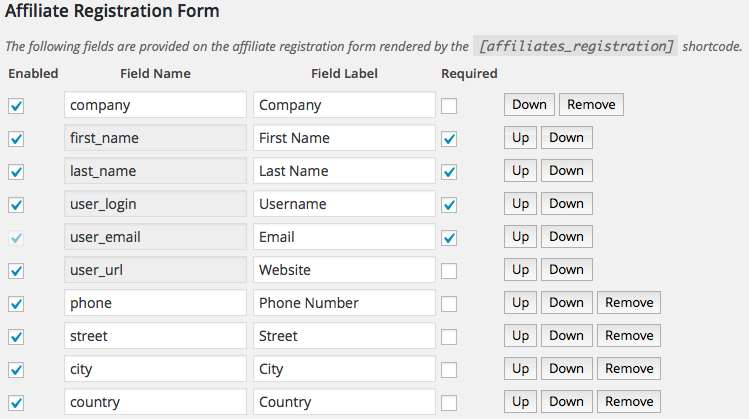 c) The field name of any enabled affiliate registration field. Note that the password field is not allowed. If the display attribute is omitted, the user_login of the referrer is displayed. For this example, we assume that in addition to the standard registration fields, we also have defined fields for the affiliate’s company, phone number, etc. The following example prints the referrer’s name, website, company and phone number. You can copy and paste the code below to a new page and test it after visiting an affiliate link. You have been referred by [referrer display="name"] at [referrer display="company"]. The above example encloses the referrer information section conditionally so that it is displayed only if the viewer has actually been referred by someone. Please note that pages using any of the referrer shortcodes must not be cached, especially if they are shown to visitors who are not logged in on your site. If those pages were cached, the same referrer information would be shown to anyone, based on the first person to visit the page which is used to create its cached version.